As promised, Jordan Brand started the year with a lot of treat for their followers after releasing a wide array of new models, retro shoes, and even new variants of shoes released last year like the Air Jordan 8.0. 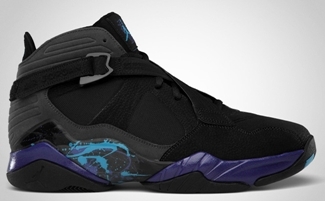 The Air Jordan 8.0, which is a re-tooled and re-designed edition of the Air Jordan 8, was released in Black/Dark Concord-Anthracite-Orion Blue colourway dubbed as the “Aqua” edition of the shoe. Featuring a mixture of black nubuck leather and synthetic on the upper part accented with concord touches on the midsole, this Air Jordan 8.0 “Aqua” is currently making a lot of noise so you should grab your own pair now!